Cook broke ground on their new facility by planting a large Tulip Poplar, symbolizing new life in the old property. Bloomington, Ind. – Today, Cook Group held a tree planting ceremony on the property of its newest facility on Bloomington’s west side. The event marks the first step in the monumental undertaking to transform the former GE facility. 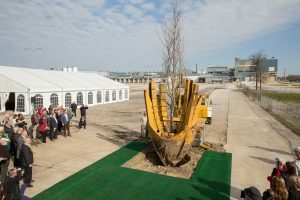 The ceremonial planting of a Tulip Poplar, Indiana’s state tree, is a sign of new life and growth for the once abandoned site. In addition to the ceremonial tree, Cook committed to plant over 200 trees on the property. In 2017, Cook acquired the abandoned General Electric refrigerator manufacturing plant. The nearly one million square feet will double Cook’s global headquarters creating a campus between the headquarters and the new facility. This project will add at least 500 new jobs over the next 10 years. Plans for the dilapidated plant will renovate the building into a state-of-the-art facility to manufacture medical devices. The first step of this revitalization is to transform the area, including a community walking path. In celebration of the event and Bloomington and Monroe County’s bicentennial, Cook gave 200 Tulip Poplar tree saplings to attendees at the ceremony.